In the face of political uncertainty and public apathy, NASA is beginning to push the case for the Asteroid Redirect Mission (ARM). The points of the Agency’s latest overview portray a mission that will foster the development of numerous key technological advances, most of which will be required for human missions to deep space and the ultimate goal of landing astronauts on Mars. 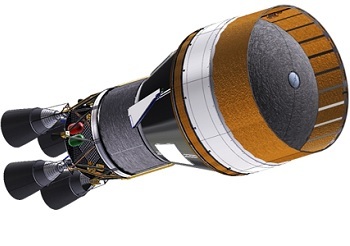 The Asteroid Redirect Mission (ARM) is the first flagship exploration mission in NASA’s new era of utilizing the Space Launch System (SLS) and crewed Orion. SLS will debut in 2018 on the Exploration Mission -1 (EM-1) flight, validating its systems along with lofting Orion 70,000 km past the Moon on a 25-day flight. The mission manifest past this point is in a state of flux, with ongoing evaluations taking place due to numerous budgetary and capability related considerations. The discussions range from the objectives of second SLS mission, through to the first launch with the beefed up Exploration Upper Stage (EUS) and the debut of a crew on an SLS/Orion flight. A possible scenario will involve EM-1 launching as planned, before a repeat of the mission, this time with a crew, followed by a cargo mission for SLS with the EUS, prior to the crew returning for flight on the fourth SLS mission. The timing of the missions will also be part of the evaluations, as the proposed ARM – which comes in two parts – may involve the robotic mission being launched by a cargo SLS, prior to the ARM crew launching before the second half of the next decade to rendezvous with the captured space rock. 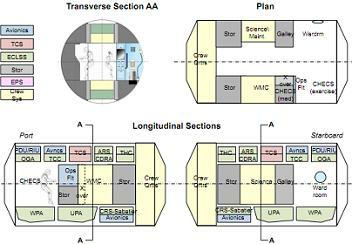 Exploration Mission -2 (EM-2) – under the plan of flying a crew to an asteroid – was to launch in 2021. However, that has since been ruled out, with 2024+ now showing in the planning schedules. Part of the schedule uncertainty is related to a level of disinterest in the ARM mission from some of NASA’s political paymasters and advisors. While the current administration is basing its mission outline on President Obama’s instructions to visit an asteroid by 2025, some lawmakers want NASA accelerate its focus on exploration goals aiming towards Mars. The irony is the ARM objectives are a major stepping stone towards that Martian ambition, as previously cited in NASA’s “proving grounds” roadmap. Overcoming numerous challenges to enable successful missions to Mars for large payloads and human crews is an evolution born out of the International Space Station (ISS) – the largest structure to have ever been assembled in orbit and the home of a permanent human presence in space. The next step is to venture back into deep space on an evolving path that will test technology that will ultimately be utilized during Mars missions. The ARM objectives will bring Solar Electric Propulsive (SEP) to the forefront as the means of moving large objects through interplanetary space, allowing that technology – already a popular form of propulsion with satellites and small spacecraft – to increase its capability. 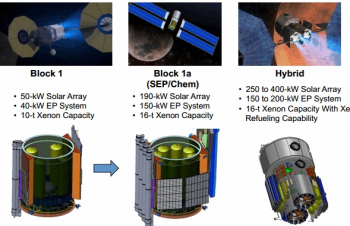 According to NASA latest overview dated this month, SEP is expected to evolve from 40-kW EP System, through to a 150 to 200-kW EP System with Xenon refueling capability. 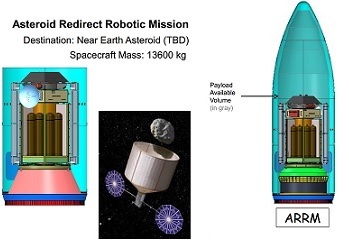 Cited in documentation relating to NASA’s deep space aspirations for several years, SEP will be involved with the robotic mission spacecraft – known as the Asteroid Redirect Vehicle (ARV) – to capture a boulder from the surface of an asteroid to begin the ARM objectives. The ARV will be launched on either a Delta IV-H or the Space Launch System (SLS) – the latter resulting in the HLV’s first “cargo” mission. Documentation shows the current NET (No Earlier Than) launch date to be December, 2020 – at a cost capped to $1.25 billion, not including launch vehicle and mission operations. 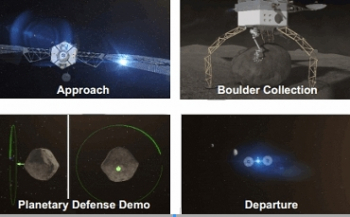 The mission will last around 18 months, involving the ascent, phasing, lunar gravity assist, SEP drive to the asteroid, characterization of the asteroid and the actual boulder collection, conducted via robotic arms that are already being developed by companies such as Altius Space Machines in Colorado. During the lengthy stay around the asteroid, the mission will also include a Planetary Defense Demonstration, aiding a politically interesting study into potentially mitigating the threat of a space rock with an intent on impacting with Earth. The ARV will then fire up the SEP and begin the journey to a Lunar Distant Retrograde Orbit (LDRO), bringing the captured boulder in the grip of its claws, ready to be examined by a hands-on evaluation from the Orion crew. The Orion launch, which will be via the SLS rocket, is also heavily associated with “providing systems and operational experience required for human exploration of Mars,” per the NASA overview. This mission will also serve as a real mission test of NASA’s modified version of the famous Space Shuttle launch and entry suit – or Advanced Crew Escape Suit (ACES) – for use not only during launch and re-entry for crews riding in Orion, but also for use on spacewalks (EVAs) during the Orion leg of the ARM objectives. The overview noted that the Orion Program completed four MACES suited evaluation in the March Vacuum Pressure Integrated Suit Test (VPIST) – the first time since Apollo that developmental pressure suits have been combined with a vehicle-level closed loop ECLSS system to provide life support while test subjects are at full vacuum. 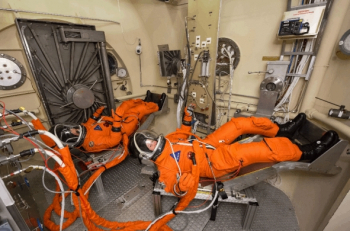 “Modified ACES is an evolutionary step from shuttle crew survival suit for closed-loop crew protection for launch, entry, aborts,” added the documentation. Testing evaluated integrated performance of Orion’s vehicle ECLSS hardware in a vacuum chamber. The mission will also aid rendezvous and flight profile objectives in deep space, ahead of an expected trip out to an asteroid located at a much greater distance from space, on a greatly increased mission duration. Such missions will be based around the HLV workhorse for the 2020s, known as the SLS Block 1B with its 105 mt capability. With the technology including Deep Space Habs and life support capabilities for missions lasting for around a year, the advances will feed into NASA’s plans to send humans on the ultimate trip to Mars.